Missourian reporter Melissa Miller wrote about the Isle of Capri Casino’s drive to purchase property for the new $125 million casino approved this week. I’m not going to even try to cover all the aspects of the run-up to the casino decision. That’s what your daily newspaper is for. Melissa’s story says the casino will be bounded on the south by Mill Street, on the north by Mason Street and on the west by Main Street. 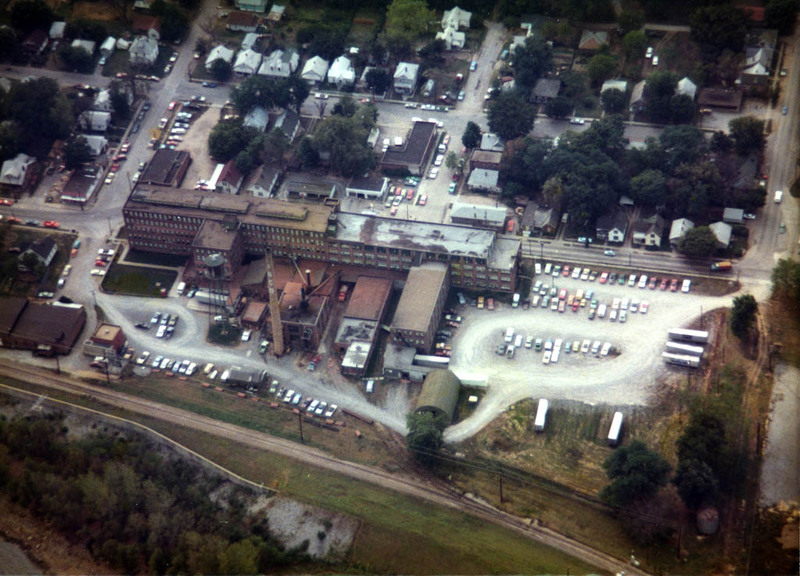 When I shot this aerial in the early 70s, the shoe factory was still in production. The facility dated back to 1906 when the Roberts, Johnson and Rand Shoe Co. of St. Louis decided to build its first branch facility in Cape after the Commercial Club agreed to provide the five-story building for free as an incentive to relocate. Wanted, Girls over 16 years of age to work on power sewing machines; pleasant surroundings and good pay while earning. International Shoe Co. Cape Girardeau. By 1921, the building was expanded. Depending on which news account you read over the years, the total square footage of the factory was either 165,000 or 138,000 feet. 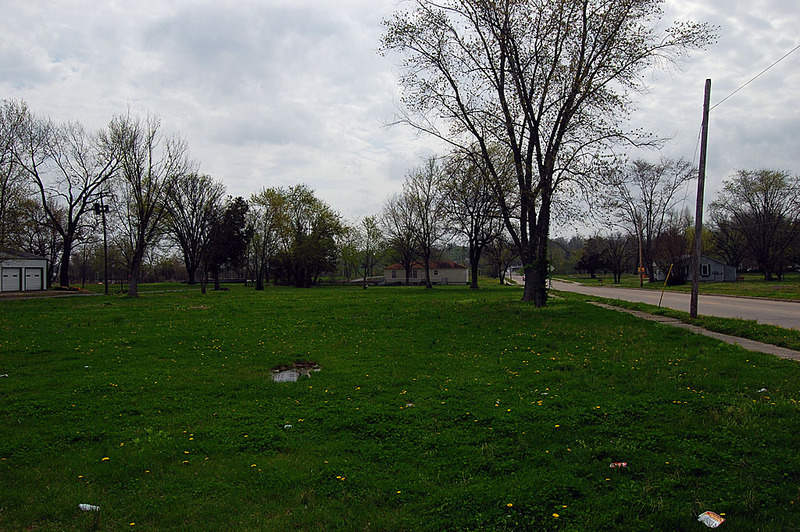 This photo, taken from the southeast corner of the property looking north in 2009, shows that virtually nothing is left of a business that employed nearly 1,500 workers in its heyday. From the Dec. 31, 1925 Missourian: Nearly $10,000,000 worth of shoes has have been shipped from the International Shoe Co. plant of Cape Girardeau during the twelve months just passed… The total of shoes manufactured at the plant during the year just closed, reaches 3,164,080 pairs – enough to furnish every man, woman and child in Cape Girardeau with 175 pairs. Now in its 18th year of operation, the shoe manufacturing plant here is constantly expanding and increasing its efficiency. 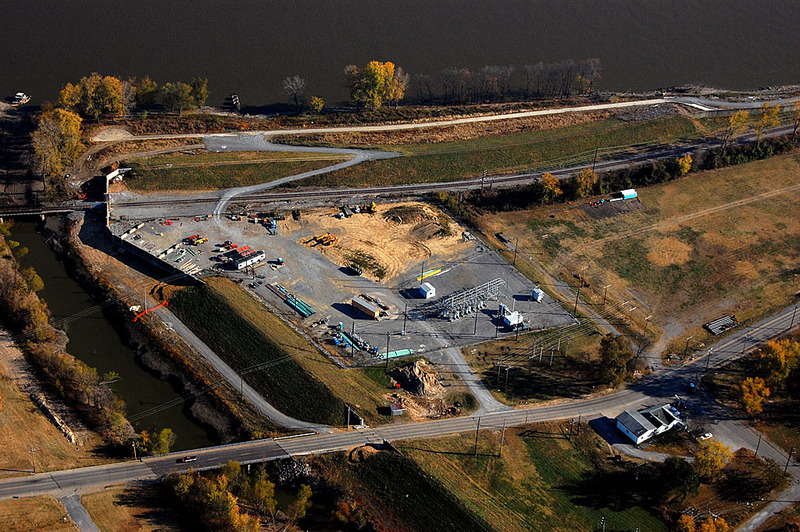 An army of employees, most of whom reside in or near Cape Girardeau, are employed throughout the year. This body of workers has been enlarged by 200 since last year, 1,600 men and women now being employed as compared to 1,400 at the close of 1924… The average weekly payroll for a six-day week is $35,000…Another year has passed without serious injury… No death or accident of serious consequence having been recorded during the 18 years that the factory has been in operation. This photo shows the intersection of Mill Street and Main Street. There is talk about relocating Main, so I suppose they’re going to shift it a bit to the west to make the casino property wider and to eliminate the slight curve in Main. Missourian reporters struggled to find new ways to tell how productive the shoe company was every year in a business roundup. Dec. 31, 1927 – Three million pairs of shoes, made in Cape Girardeau, if placed end on end, would reach 9,500 miles, more than twice the distance from New York to San Francisco, or would require a train nearly three miles long to haul them, based on the average length of men’s shoes made at the plant. The wholesale value of the shoes made at the local plant is about $14,000,000. The factory is operated on a 50-hour-a-week basis, the employees working nine hours a day the first five days of the week and five hours on Saturday. This is the north end of the property. The white building at the bottom right of the frame is the Cape Mart convenience store at Mason and Main Streets. Oct. 18, 1932 – The International Shoe Co. factory has kept from 1,150 to 1,400 employees steadily at work never less than four days a week manufacturing slightly more than two and a half million pairs of men’s fine dress shoes. One million dollars of the annual payroll of Cape Girardeau is maintained by this one concern. This is the largest dress shoe manufacturing plant in the world. In 1929, The Missourian asked residents to list the city’s greatest accomplishments in the past 25 years. 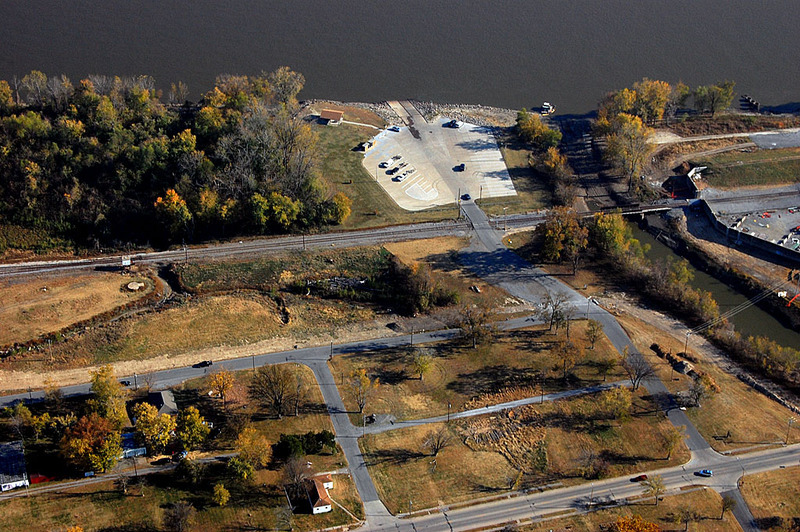 The bulk of the respondents listed the shoe factory, the Marquette Cement Plant, the Missouri Pacific railroad and the new Mississippi River Traffic Bridge. The empty lots in the Red Star district also reflect the beginning of the end. Too many floods in too short a time dealt a death knell to the vibrant community north of the shoe factory. By 1998, the city had acquired 94 of 114 flooded homes that were eligible for a FEMA buyout program and had started tearing them down. By the 1960s, more and more of the stories talked about union troubles, plant slowdowns and plant closings in the shoe industry in general. Cape wasn’t immune to it. In 1994, a syndicated story said that once Missouri was second only to Maine in shoe production. Now, the United States, the story continued, had lost 70% of its shoe markets in imports. Up to 87% of all shoes sold in this country came from overseas, with about 60% of those being made in China. In 1984, The Florsheim Shoe Company built a new plant at Highway 74 and West End Blvd. The old factory was donated to the Chamber of Commerce, which debated for years what to do with it. In 1994, Florsheim Shoe Company was named Industry of the Year in Cape for its 450 employees who turned out 3,100 pair of shoes a day for an annual payroll of $6 million. By 1999, the work force had dwindled to 300 workers. Not long after that, the manufacturing process was moved to India. The Cape Mart convenience store at the corner of Main and Mason is one of the properties optioned to the casino owners, so I would suspect that its days are numbered, too. “There is some reason to believe that the site would be far more valuable without the five-story factory building than with it. Six acres of cleared property protected by a floodwall and served by a railroad in downtown Cape Girardeau is a considerable asset. Ideas that come to mind include special commercial purposes, an industrial site or the location for high-rise apartments or a hotel. When I typed the search phrase “shoe co” into the Google News Archives, I was struck at how much a part of Cape Girardeau the shoe factory under all its names was. Scores, if not hundreds, of names popped up: in the early years, it was couples who worked at the factory getting married and starting families. In later years, right up to the present, it was in the obituaries of folks who had worked there for 20, 30 and even 48 years. A faux riverboat gambling casino may bring all of the good things to Cape that the owners promise, but I doubt that it will ever become a part of the fabric of the community that the shoe factory was. My family moved from Koch Addition to North Main shortly after my birth. We lived in the first stucco next to Atkins Machine Shop. The Rudolph “Rudie” Scholl family in the next stucco & the 3rd house next to the shoe factory parking lot sheds was the Givens Family. The shoe factory anchored our little community & gave the neighborhood its name “Red Star”. I hated to see the building come down even though I’m sure I would hate even worse to see it decay brick by brick! I regret that an ugly, Jetson’s looking, gambling establishment will take its place! If the lot had a heart it would be breaking I’m sure…once on that very same spot people worked hard to provide for their families & themselves & now people will dispose of their money as entertainment. I am amazed at the number of voters, who stated they didn’t gamble & many didn’t believe in gambling but they think it will be a good thing for Cape. “I wonder how many would like that “good thing” for Cape in their neighborhood? I will still see the ghosts of all those good people that walked by our house with their lunch pails waving their friendly hellos when & if I ever travel that way again! My deepest regrets goes out to the families that still remain with a neon flashing. eyesore as a neighbor! My father was the First C.I.O.Union President of the Plant when it was organized under the ownership of The International Shoe Company.He served that capacity until he went into the Armed Forces in 1944.He was so proud of the fact that he was 19 years old when first elected and only had a 7th grade education due to the times. I am also very proud of what he accomplished. That name sounds really familiar to me. I thought maybe he had a shoe repair store here in town. Let me do some checking. Maybe somebody else knows right off the top of their head who Johnny Landeau was. OK, my friend, the Shy Reader, came up with the info. Here’s a link to an obit for John Lando, shoe repairman and boxer. Sounds like he’s your guy. I grew up to the sound of the shoe factory whistle and the sound of all the machines going.Red Star and Marble City Heights is where alot of shoe factory workers lived and alot of them walked to work. The flood changed that part of Cape and now it for sure will never be the same. My father, Louis Beaudean, started working at the International Shoe Factory following his graduation from high school in 1937. The company held his job for him when he was drafted in 1941…WWII. Louis Beaudean eventually became superintendent of the Cape Girardeau factory. I have some wonderful pictures of workers inside the factory; several floods that surrounded and entered the factory; and others. I have wanted to share them with those who remembered the factory but have never known how to go about doing this. I, too, wish a casino would not be built on this site. Lynn, I’m sure many others like me would like to view your photos of the inside of the plant, especially of the workers. Could Ken post some on this site if you emailed copies to him? My mother worked at the plant in the 1950-1960s. Does anyone know of a list of employees and years they were employed? I would be more than happy to run the photos if they aren’t copyrighted. I’m pretty sure I was never inside the shoe factory. Myi mother went to work there in 1932, when she was 16. The Depression wiped out her chance for a high school graduation. My dad, John Whitright, spent about half his life as a shoecutter at International, and raised a family of 6 “young-uns on his hard won earnings. I too hate to see the place being given over to a casino but I guess time marches on. I picked up many bus loads of people at the factory when they got off from work back in the early 50’s. The death of the Red Star District occured when it was placed outside of the floodwall. 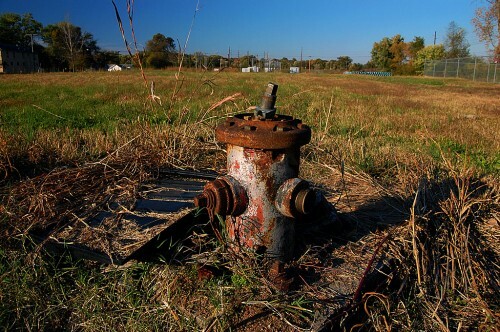 A once thriving community simply began to disappear. Where there were once homes, gas stations, quick shops and fountain shops there is almost nothing. The Red Star Baptist Church and a few homes are all that have survived. The casino will be the sure death of this area. I find it difficult to understand how residents of Cape think a casino with low paying jobs in the hospitality industry is going to bring anything positive to the area. Oh, well. So much for my grandparents way of life. Thanks, Ken. It’s’ a part of my upbringing and I’m so grateful for the values the folks at the school factory handed down. Ken, this post was downright literary! Or really good journalism. You decide. My only brother, Joe, Jr., 9 years older, was quite adventurous as a youngster. He and a buddy used to race side by side from downtown Main St. to the shoe factory site, where the sharp “dogleg” zig-zags left-to-right. This was always late at night, being careful police cars were not around, or traffic from the opposite direction. He never got hurt but I recall he tore a door off–reminding me a bit of the movie Rebel Without A Cause and the great chase to see who would bail out of his auto first before the drop-off. Later, on a date and with another couple in the back seat, returning from either the Colony Club or Purple Crackle just across the river in southern Illinois, he hit the narrow end of the toll bridge barrier head on. Everybody was hurt, thankfully not seriously, but certainly close. His antics accounted for my being less risky, but then everyone takes chances now and then. Ken, you just keep filling up my computer with wonderful memories of days gone by. I save so many of your articles! I grew up about 4 blocks north of the shoe factory with our home being high on a hill on Spanish Street. The floods only ever came up to Main Street where Brune & Eaker’s Gas Station was located when I was a child. I remember going swimming in the flood water next to the gas station and that black gumbo mud seeping between my toes after it went down. But, when they built the flood wall only up to Sloans Creek, it was devastating for Red Star. There is so little left of the homes and businesses that were in that area, but I still think of all of the sweet people and families who lived there when I drive up Main. They were wonderful, close-knit families who maintained their homes with a lot of care and dignity. The Cole & Webb Family who owned the grocery store on 4th & Main were so good to all of the neighborhood kids to let them wait inside the store for the school bus when it was cold and rainy. And the Lowerly (sp? )Drugstore later owned by the Eakers were good to the kids in letting us hangout there after school where the bus dropped us off just across the street from Cole & Webb. The people in Red Star who worked at the shoe factory were hard-working, strong Americans very much like the ladies who built airplanes during WWII. Many walked to work during all kinds of weather. I walked downtown past that noisy shoe factory many times hearing the clickety-clack of the machinery and seeing guys hanging out of the windows watching all the girls go by. One other thing, that gas station you show in the article “Cape Mart” was once owned by my grandparents back in the forties. I have a picture that I love of them standing in front of the tall glass gas pumps. Anyway, thanks for the article. It brought back many wonderful memories of my childhood and all those wonderful families who helped raise all of us! I guess when they build the casino, the only public place for the neighborhood will be the Red Star Church. Long may it stand! I don’t know if you saw the piece I wrote about Brune and Eaker’s Gas Station. I don’t think I shot many photos in the Red Star area (except when it flooded). I’ll keep my eye out. The pictures and articles regarding the shoe factory prompted some of my earliest memories of life in Cape. After graduating from High School in Dexter my father moved to Cape to work at the shoe factory. Around 1938-39, when I was 3 and 4 yrs. old, our family lived right behind the Red Star Baptist Church, on the northeast corner of N. Spanish and 4th Streets. I remember a summer day, sitting in a wash tub in the back yard, seeing my Dad walking home from the shoe factory with his lunch box in hand. Click here to see some other photos from the shoe factory neighborhood. My grandmother, Octavia McCrite, was in deed the woman that was scalped. She reached down to pick up a pencil and a machine caught her shoulder length hair and ripped her scalp from her head. She spent months in the hospital and has been written up in medical journals due to the loss of blood and her survival. She suffered from the numerous grafts that were taken from her legs to cover her head, and once healed, from the unsightly scars. The wigs she had to endure over the years were costly and unattractive at best. She had two young children and the settlement from the shoe company was less than $4000. Wow! I swear, you readers are great. That’s detail that I haven’t seen anywhere else. The Lowery (sp) Drug Store was owned by Sam and Dorothy Lirely, my mother’s cousin. I remember going there to the soda fountain when visiting my grandparents who lived where the recreation center of Red Star Baptist Church is now. P.S. I’m surprised the tornado in 1949(?) was not mentioned as also being the cause for the decline of Red Start area. I believe there were many homes destoyed “up the hill” from Red Star Baptist Church. You might be interested in reading this gripping account of the 1949 tornado in a letter written by a young woman to her mother. Delores Dietrich, if you are still around, I would like to chat about Sam and Dorothy Lirely – they were members of the Lyerly family, of which I am also a descendant. Which side of the family was your mother related to? David Middleton: After further reading in our family history I discovered that if the shoe factory had not been in Cape I would never have been born. My mother’s family moved to Cape from Southern Indiana when she was 8 yrs. old, following her older brother who moved there to work at the factory. He died soon after the move but my grandfather, Rufus Austin, remained as a auto mechanic [working for Ford Graves] and as a team engineer. He used to operate a steam roller over the streets of Cape, including Mill Street Hill and Snake Hill. 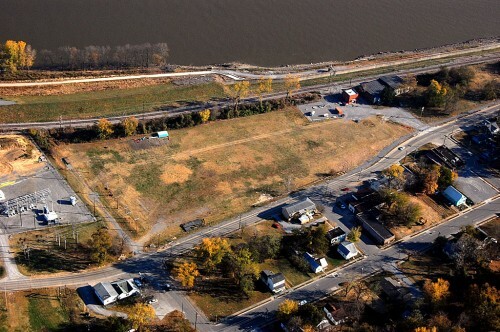 He also built and drove race cars on the old fair ground track which was south of the current arena park. After graduating from high school my father moved from Dexter to work at the shoe factory, and there he met my Mom at the First General Baptist Church on Broadway hill. They were married her parents house, directly across the street, which was the last remaining house between the old frozen food locker and the pass through to the court house. During my high school days it was the home of Barbara Daniels Popp and I attended a couple of parties there with her and my best friend John Popp. I understand that Barabara is doing some research on the history of the house. Another connection to this story is that my grandmother Austin’s brother moved with them from Indiana to Cape. He was Tom Brothers, a well known painter in Cape, and during WWII, had five sons [all Brothers of course] in the Navy at the same time. When these families moved to Cape they sent their furniture and house goods by boat and they traveled by train. I guess we take so much for granted when we are younger. We just don’t know what history people are making right in front of us. My Dad worked at the “old shoe factory” as everyone called it back when I was was a kid before he started working for the government. My Mom was a banker at the old First National Bank. We only had one car and I was sitting here thinking about “how did Mom and Dad both get to work with only one car”. Weird how I never though about it before. I guess one dropped the other off and then went to their work. But, I do remember Mom driving us down to the shoe factory to pick up Dad from work. This must have been on a Saturday because, “if we were good”, Mom would treat us to a triple decker at Woolworths after she did her shopping. I remember sitting in the car and like another person posted, hearing the “clickedy-clack” of the machines and seeing the young boys and men hanging out the windows looking at the girls in the streets. AND THEN THE WHISTLE BLEW. What a memory!!! We then knew Daddy would be on the way to the car soon. I never realized how many people the shoe factory employed. I sure knew there were a lot of people that swarmed out of the building after the whistle blew. I had no idea that the building was so big in the back. Well, lots of buildings clustered together. My Mother grew up, along with 10 brothers and sisters, on Water Street, next to LeGrand’s Garage. Her old home is gone now because of the flooding. I drove down to see the new casino and drove on down to Water Street, in Red Star, and was surprised to see how many houses were gone and all the vacant lots, with all those memories of the past swept away with a push of a bulldozer. It didn’t even look familiar anymore. Mom would tell us when they walked to school, she would stop at Cole’s store to warm up. Like I, she had Raynauds Syndrome and her fingers would turn white…but when they started to warm up and the blood would get to circulating again, that’s when the pain would come. She said the people that owned the store were so very nice to the kids that would stop in. Sorry, I wrote a book again. LOL I just get a little bit carried away with my memories! Feel free to write a book anytime you want to. I’m talking with SEMO’s Special Collections folks about picking up this blog when I go on the dark side of the dirt. Somebody will find your recollections important when they try to reconstruct the history of the area. The stories you share aren’t written down in formal histories of Southeast Missouri. Keep ’em coming. Does anyone recall if there was a boat dock behind the shoe factory? I am researching that area. I would also be interested in talking to any surviving workers from the earliest possible times at the shoe factory. Thank you. I am also interested in viewing any photos of the riverfront directly behind the shoe factory. The older, the better. The 1964 aerial here doesn’t appear to show one, but it was also shortly after the floodwall was built, so that would have blocked access to the river. Thank you Ken. I always enjoy seeing your photographs. Randy. My grandparents Joe and Jewel Scholl (and their daughter, my mom Martha) lived in one of those houses next door to Joe’s parents (Rudolph and Martha Scholl) opposite from the Givens family. They moved to Poplar Bluff, MO in 1963. 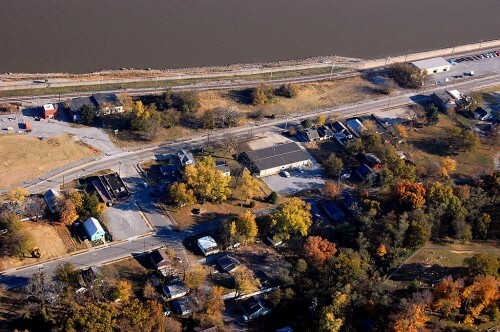 My grandma Jewel Scholl tells me that Rudy Scholl’s boat dock was on the river right across from his house. He was coxwain for the Coast Guard and tended the river lights from there during WW2. She remembers a Libby Koch from Koch Addition, who’s house they moved into in 1955. Tim Schenks, just saw your post, you must be Martha’s son, who was my playmate when she visited at your Great Grandparents house next door. I remember your G-Grandma Martha & G-Grandpa Rudy and lots of memories of those days. Neighbors were close like extended families and block parties on the 4th of July, sharing in good times & bad. Tell them all hello! In my minds eye I see Martha senior setting on a stool in her kitchen hand beating a homemade angel food cake batter in the summer heat. She was a beautiful lady with a Dutch/German accent & her dark hair done up in a bun, a floral dress with black background, and shiny black beads with ear bobs to match. Thanks for the memories Scholl Family!